The Scottish rockers are hoping to unveil the follow up to 2013's Opposites towards the end of 2015. 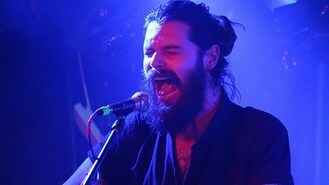 Frontman Simon Neil told XFM: "I've written about 14 songs so far. We're kind of doing some demos of them at the moment. "The fact that the ball is rolling on this record is very exciting, I think we'll look to record it maybe the start of next year, possibly out for the end of next year." Simon also revealed the Black Chandelier singers are planning to lay low for a while after their summer slots at T In The Park and Isle of Wight festivals, to make sure people don't get tired of seeing them. "It's probably wise for us to disappear for a wee while, as well," explained the 34-year-old. "We've had so much love from people and they've been so kind but there's nothing worse than a band that just stays in your face for ages and ages so we'll probably disappear for a while and hopefully you guys will miss us."